Efficiently extracting knowledge from the published literature is a challenge faced by many database projects in biology, and many of us are interested in tools that can assist and speed up the task of identifying concepts in free text. I’ve recently used two text markup tools that are helpful in keeping up with the literature and rapidly developing ontologies. As a participant in the Fifth BioCreative Challenge, in which biocurators test and evaluate text mining systems, I evaluated the EXTRACT bookmarklet tool. EXTRACT was developed for metagenomics data and provides full-page tagging of mapped terms from environment, disease, taxonomy, and tissue ontologies, and can also markup shorter selections of text on an HTML page. The tool is immediately useful, particularly during the first stages of the curation process, as a curator is surveying the literature for relevant articles. Annotating long, descriptive text has also been a challenge for Phenoscape. To assist curators in this task, we recently added a text annotator tool to the Phenoscape Knowledgebase that tags selected text passages copied in from a source with matched terms from anatomy (Uberon), taxon (VTO), and quality (PATO) ontologies. Viewing the annotated results, with color-coded text, has aided curators in the process of applying large, complex ontologies to equally complex text. A team led by University of Chicago Phenoscapers Nizar Ibrahim and Paul Sereno have published new findings about the remarkable semiaquatic predatory dinosaur Spinosaurus aegyptiacus in the latest issue of Science. It has been receiving some nice coverage at NPR and other news outlets. 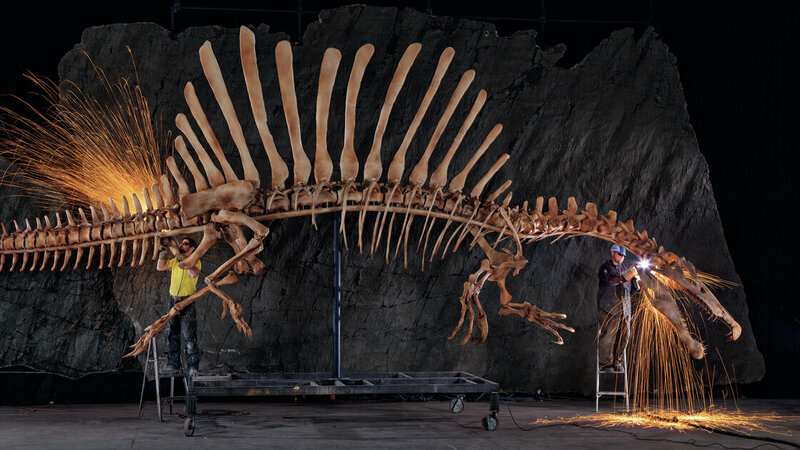 Workers at the National Geographic Museum in Washington grind the rough edges off a life-size replica of a spinosaurus skeleton. Credit: Mike Hettwer/National Geographic. Citation: Ibrahim N, Sereno PC, Dal Sasso C, Maganuco S, Fabbri M, Martill DM, Zouhri S, Myhrvold N, Iurino DA (2014) Semiaquatic adaptations in a giant predatory dinosaur. Science. http://doi.org/10.1126/science.1258750. I attended the Evolution 2014 meeting a few months ago in Raleigh, NC, and presented a poster on Phenoscape’s curation effort: “Moving the mountain: How to transform comparative anatomy into computable anatomy?”, with coauthors A. Dececchi, N. Ibrahim, H. Lapp, and P. Mabee. In this work, we assessed the efficiency of our workflow for the curation of evolutionary phenotypes from the matrix-based phylogenetic literature. We identified the bottlenecks and areas of improvement in data preparation, phenotype annotation, and ontology development. Gains in efficiency, such as through improved community data practices and development of text-mining tools, are critical if we are to translate evolutionary phenotypes from an ever-growing literature. The poster was well received and several researchers at the meeting were interested in learning more about open source tools for phenotype annotation. Our paper describing the Vertebrate Taxonomy Ontology (VTO) is published! See: http://www.jbiomedsem.com/content/4/1/34 . One primary objective for Phenoscape and similar projects is to aggregate phenotypic data from multiple studies to named taxa, which in many phylogenetic studies are species but also might be at higher taxonomic levels such as genera or families. While there are many widely used taxonomies that include rich sampling of species and higher taxa, for example Bill Eschmeyer’s widely used Catalog of Fishes, there are few vetted “bridging” taxonomies that allow for aggregating data across, say, fishes, amphibians, and mammals. This problem becomes even more acute when you consider integrating data for extinct taxa as well. As a first step towards addressing this issue for vertebrates, we created the Vertebrate Taxonomy Ontology (VTO) that brings together taxonomies from NCBI, AmphibiaWeb, the Catalog of Fishes (via the previously existing Teleost Taxonomy Ontology), and the Paleobiology Database. The resulting curated taxonomy contains more than 106,000 terms, more than 104,000 additional synonyms, and extensive cross-referencing to these existing taxonomies. The Phenoscape Knowledgebase will leverage this taxonomic ontology by allowing for phenotype statistics to be displayed by taxon, including coarse measures of the extent of annotation coverage and phenotypic variation. Though phenotypes may be annotated to a species, the use of an ontological framework for the taxonomic hierarchy facilitates aggregating phenotypes to higher levels, such as genera or families. In the future, we hope to be able to integrate other excellent and rich sources of taxon-specific taxonomies, such as that in the Reptile Database or the International Ornithologists’ Union Bird List. This is a work-in-progress and the Phenoscape team is certainly interested to integrate new taxonomic sources as well as explore different ways that such a resource can be used and developed by the larger community.